Eaton's understanding of Parts of Speech is going very well. Honestly, I didn't expect him to understand that at this age. 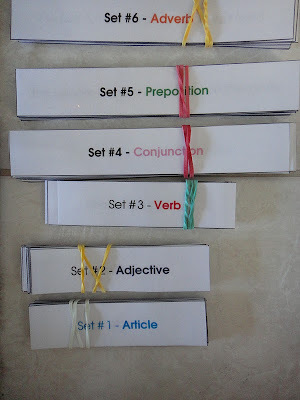 But because of his nice progress I did introduce English grammar lesson by lesson. I think that the reason he understands all these parts of Speech is because his excellent reading and amount of vocabulary he knows. All because of so many books that were presented to him. Eaton loves books and I want to write another post about that as well as about types of books we borrow from local library. 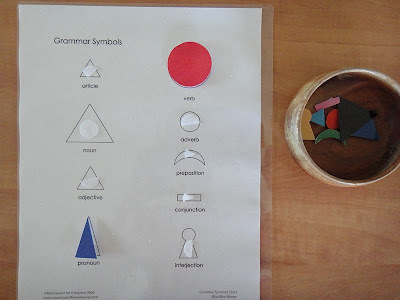 In this lesson I used Montessori For Everyone materials. 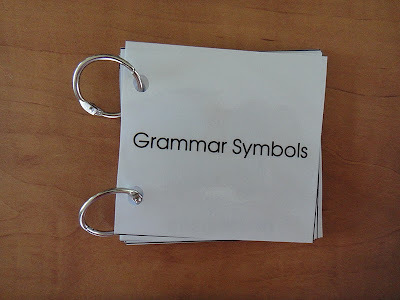 I created a small book with all grammar parts of speech. 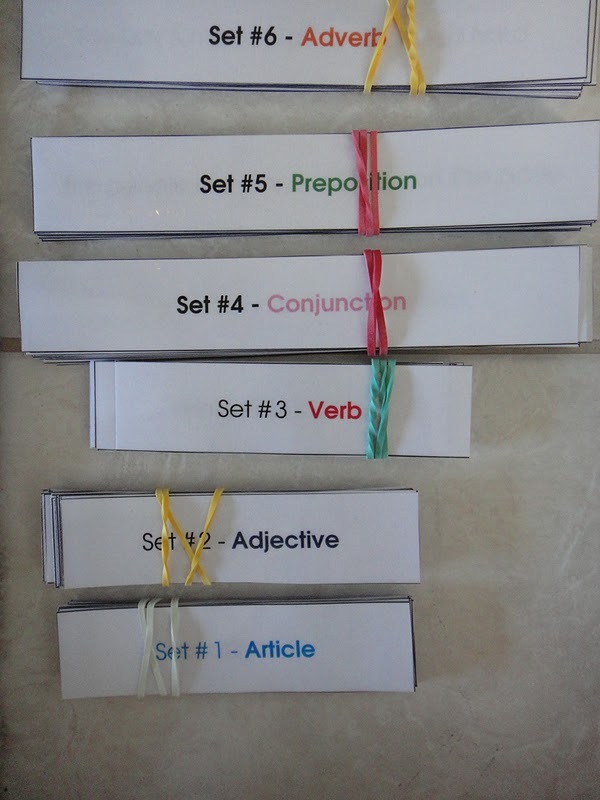 Eaton likes to read about new materials, so creating books is something I do a lot. 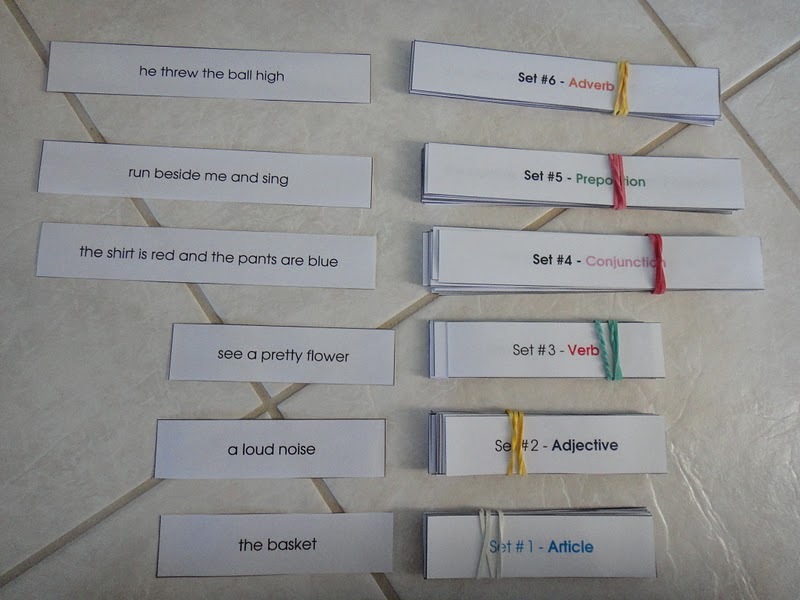 After reading a small booklet with parts of speech it was time to test it with that simple matching activity. 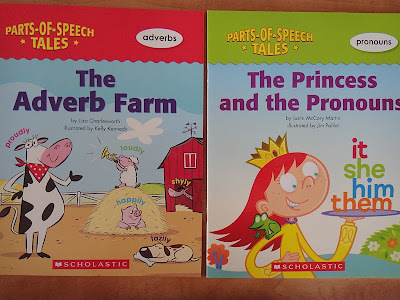 We own all of the books from Parts-Of-Speech: Tales by Scholastic. 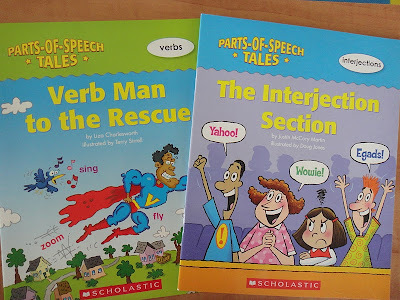 I mentioned them few times in my previous post because they made huge difference for Eaton, who loves to read. These books are funny and pictures are very appealing to a toddler. Few activities are included at the end of each book. 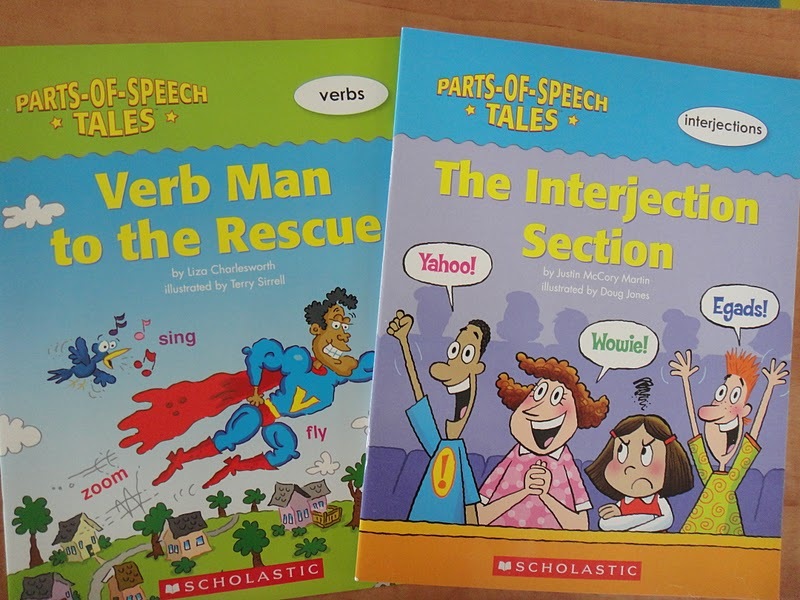 These books are very colorful and simple enough for early reader. Next step is all about using phrases and matching grammar symbols to written words. I have many cards ready for Eaton to use (Montessori For Everyone). We started with the simplest one example: "a boy". 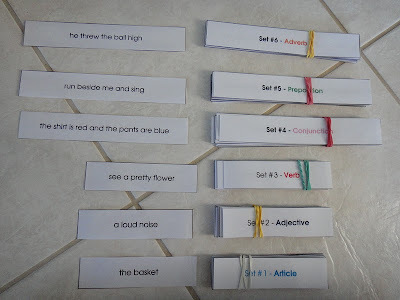 We went through article, noun, adjective and verb cards so far. I think that because Eaton reads very well he intuitively knows what noun (or other parts of speech) is. He just needed to know how to name them. We still work with these sentences. We do them about every second day. 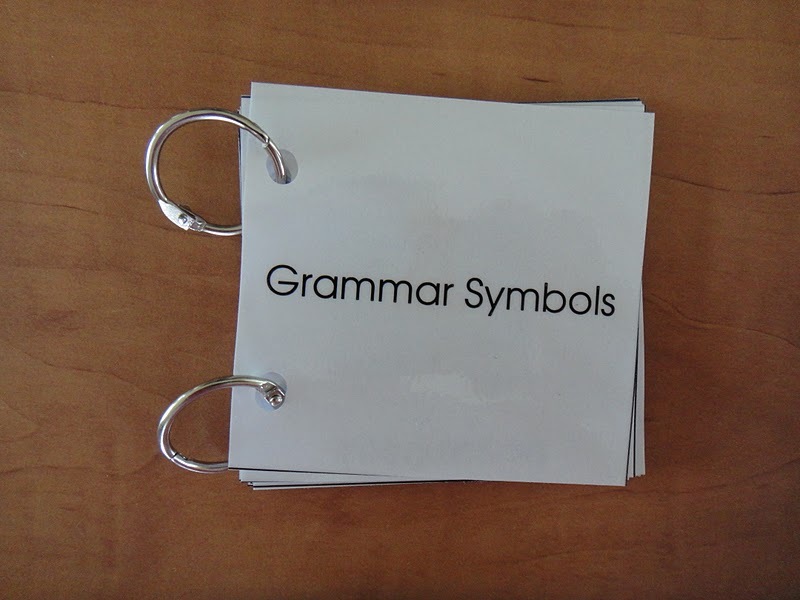 I use Kathy Grove Grammar Curriculum. Very well done! This is amazing mummy!Thank you for sharing. Eaton is an adorable smart boy! Marta, what is Kathy Grove Grammar Curriculum? Here is the link to Kathy's Grove curriculum. You can find other subjects as well. Can you please send me the link for Kathy Grove's curriculum I cant find it.